4 Bed | 3 Bath | 2,225 sq. ft. This 4-bedroom plantation home at 3200-foot elevation in Kula Maui offers breathtaking bi-coastal views and architectural artistry throughout. Finishes include imperial plaster walls and ceilings, cherry hardwood floors, and custom windows. There’s a gas fireplace in the living room for cozy winter nights and French doors that lead to a covered lanai with 4 island views. Two lanais offer unique feels that are relaxing and private while extending the useable living space of the home. Take a walk along the garden path as you meander through sculptured terraces along rock-walls which follow the sloping terrain into the secret garden. At the end of the day enjoy the view watching the ever-changing sunset and rays of light dancing across the valley floor below. Find Kula real estate and Kula homes for sale in Keokea Maui. The first time we saw Malia Uli Place we were amazed by the bi-coastal views and breathtaking beauty. We were especially drawn to Kula and Keokea. Mornings are our favorite, sitting with a cup of coffee taking in the view and feeling the stillness of the mountain. The air is cool and crisp. The sun rises behind us and its unusually peaceful and quiet. We love reading on the lanai listening to the waterfall or taking a stroll through the terraced garden. Up here you can see four Hawaiian Islands, and five different climate zones. There’s nothing like it. Keokea is a small country town with a rich history. 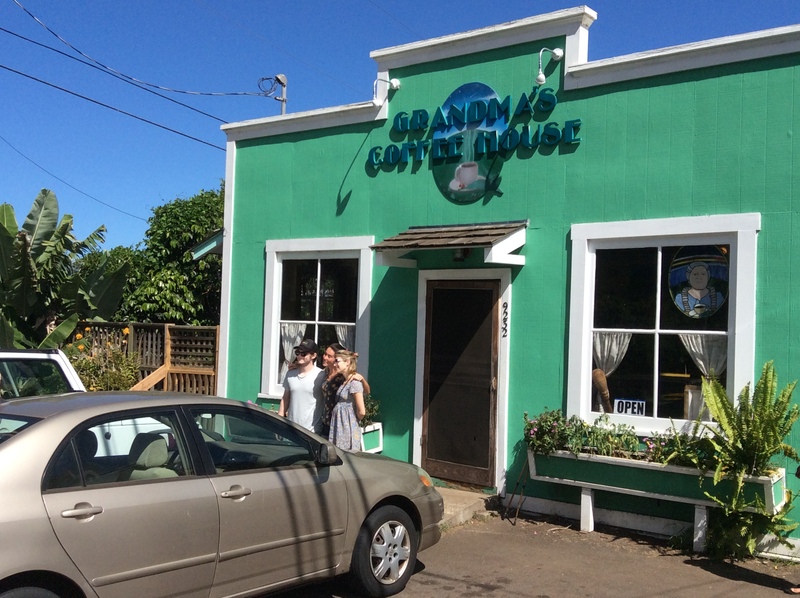 On weekends we meet friends and neighbors at Grandma’s Coffee House. Not far away is the Upcountry Farmers Market, which is open on Saturdays where we go to get fresh local produce. Malia Uli Place has a unique floor plan with 3 of the 4 bedrooms on the main level and a separate second story master retreat or in-law suite with separate entrance. Each room offers spectacular ocean and mountain views with a unique feel. The layout provides pleasing aesthetics along with comfort and functionality. We love the style and architectural details, Imperial plaster walls, and the warm fireplace which makes it cozy on cooler winter nights. The climate could not be more perfect. Two lanais are completely private and relaxing, each with a unique feel that extends our useable living space. At the end of the day looking down from our perch at the top of property, we enjoy seeing the ever-changing colors and rays of sunlight dancing across the valley floor. The sunset gives a unique performance every evening followed by the rise of the city lights twinkling in the distance. Whether it’s waking up to breathtaking bi-coastal views as the sun crests over Haleakala, or enjoying the rays of sunlight dancing across the valley floor below, the lifestyle, the privacy and the peacefulness of Upcountry Living in Keokea is why we call it home.